In our global economy, companies need streamlined operations in order to stay competitive. There’s no room for inefficient systems in today’s thriving industrial facility. Our goal is to create efficiency, streamline plant logistics, and automate processes in order to offer our customers a leg up, helping them stay lean, agile, and competitive in today’s markets. 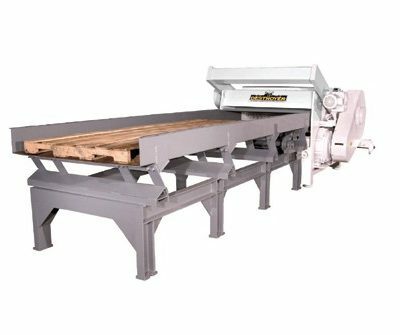 The AMS family of companies provides new and used automated equipment and systems, software and design services for the material handling, wooden pallet and timber processing industries. Founded as a design and engineering firm in 1997, we provide service-driven solutions to help our customers stay competitive in today’s challenging markets. Offering expertise in engineering, fabrication, assembly, installation and controls, we are uniquely equipped to provide turnkey solutions. We manufacture our equipment and support our entire line of services in-house, from engineering and fabrication to assembly and installation. This gives us the efficiency to offer better quality control, lower costs, and a higher level of service than the competition. Rounding out the knowledge and industry experience that AMS offers, Mech-Fab Services, Advanced Electric & Controls, and PalMate, add fabrication, assembly, controls, and robust business management and data tracking software to our capabilities. 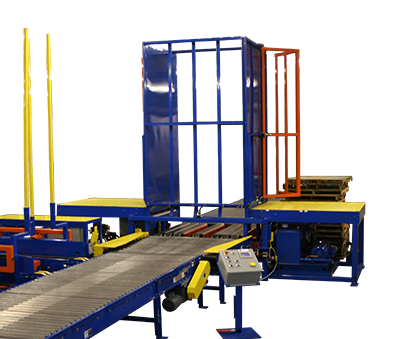 As a single company, we offer scalable automated solutions that meet virtually any material handling challenge. 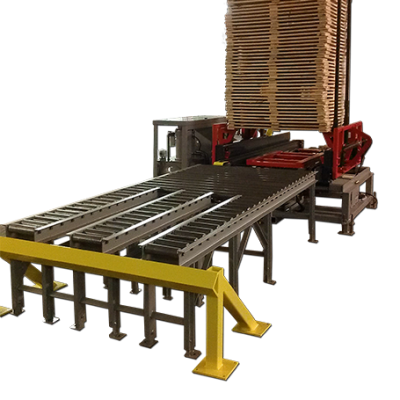 Discover how efficient your wooden pallet, crate or container plant can be, and learn why manufacturers all over the world are partnering with AMS to meet their automation goals. Contact us with your questions today. In 1997, Automated Machine Systems was founded by entrepreneur, Kris Chayer. Armed with extensive experience in machine design and manufacturing, as well as automotive tool and die, Kris saw opportunities to build dramatic new efficiencies in Pallet Recycling through automation. 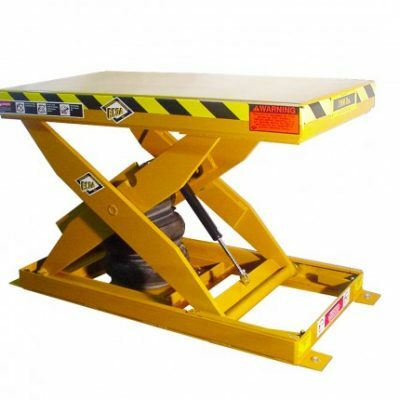 He founded AMS as an automated equipment and system design and engineering firm, leveraging his experience in the pallet industry to create innovative solutions for a niche that needed them. Building a talented team of individuals and experts to help support this vision with a wide range of skills, Kris quickly grew AMS to be a major contender in the industry. Before long, AMS began manufacturing its own line of equipment, which created significant efficiencies for AMS’ customers. As the company quickly grew, the team continued to develop its product catalog which came to include a wide range of pallet recycling, material handling and conveying equipment. 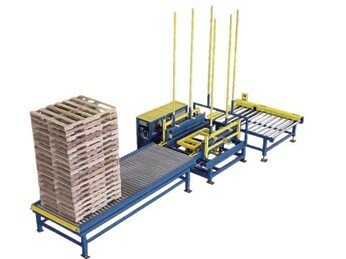 In response to the pallet industry’s demand for further innovation, the AMS team developed PalDraw™, a pallet design and quoting software program, in 2004. Just two years later, the team broadened their software vision and took their expertise much deeper in the development of PalMate® ERP. The new Enterprise Resource Planning software revolutionized the pallet industry by combining plant-wide operations, from production, inventory and logistics management to sales, purchasing, and reporting, all into one simple interface. The same year PalMate® ERP was released, AMS expanded their operations with the addition of another new division: Mech-Fab Services. Initially launched to provide the fabrication and mechanical assembly required for AMS’ equipment and systems, Mech-Fab Services now provides fabrication services to manufacturers all over the US. In 2009, AMS launched yet another division, for the same reason: Advanced Electric and Controls, designed to engineer and create the controls needed for AMS’ projects. Like Mech-Fab Services, AEC has grown to provide industrial electrical and control systems to customers nationwide. Today, the innovative design and engineering of automation remains core to what we do. And while our capabilities have advanced exponentially, our commitment to service driven solutions is as strong as ever.